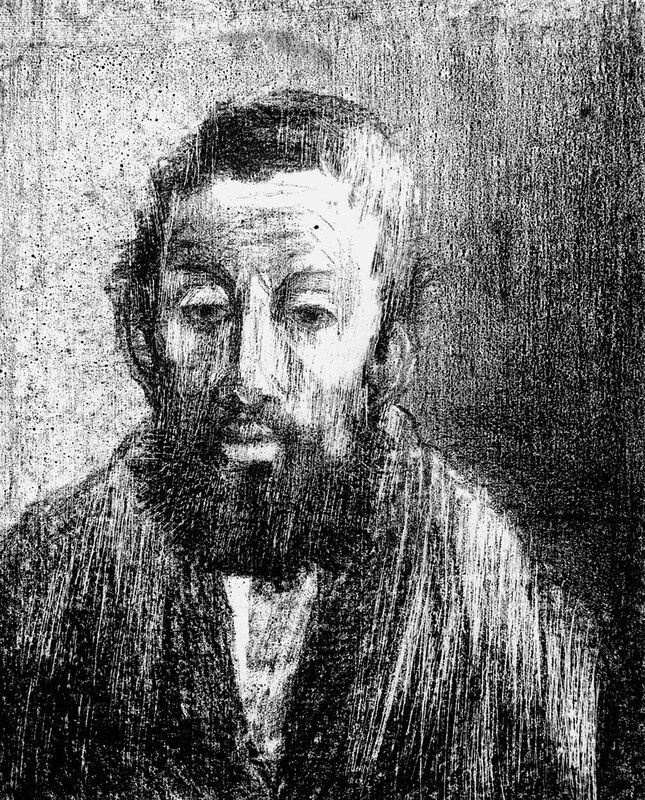 description A full-face, head-and-shoulders lithographic portrait of a middle-aged, Orthodox Jewish man with a beard and yarmulke (or skullcap). Although he faces outward, his eyes are partially downcast so that he does not engage with the viewer. 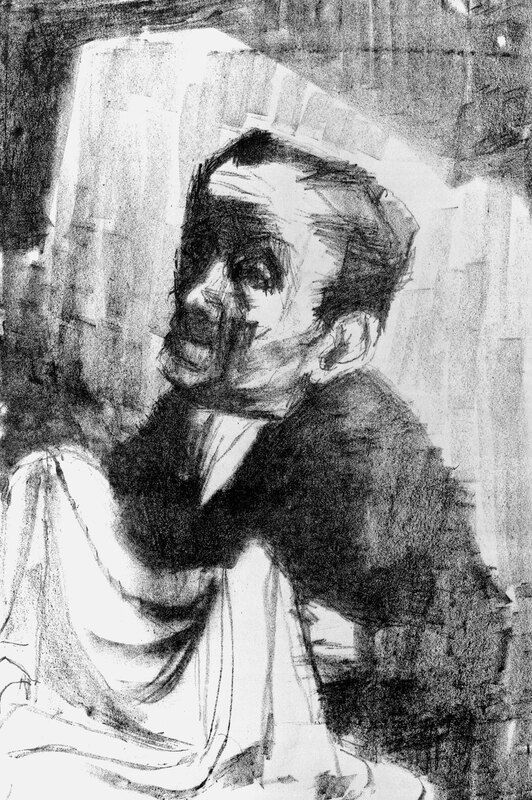 Frankfurther began making lithographs in 1952, the majority focusing closely on the sitters faces and employing similarly cropped head-and-shoulders formats. She also created a number of Jewish subjects, among them 'Street Conversation' and 'Cloth Merchant, Whitechapel Market'. Her use of strong vertical lines suggest that 'Jew' was among her early lithographs. Unusually for the artist, it is also precisely dated (verso) '28/11/1953', and it is likely that she exhibited it at the East End Academy's Annual Exhibition at the Whitechapel Art Gallery, which opened the following day. Her work in this exhibition was commended by the critics of the 'Jewish Chronicle' and the 'Birmingham Gazette'. 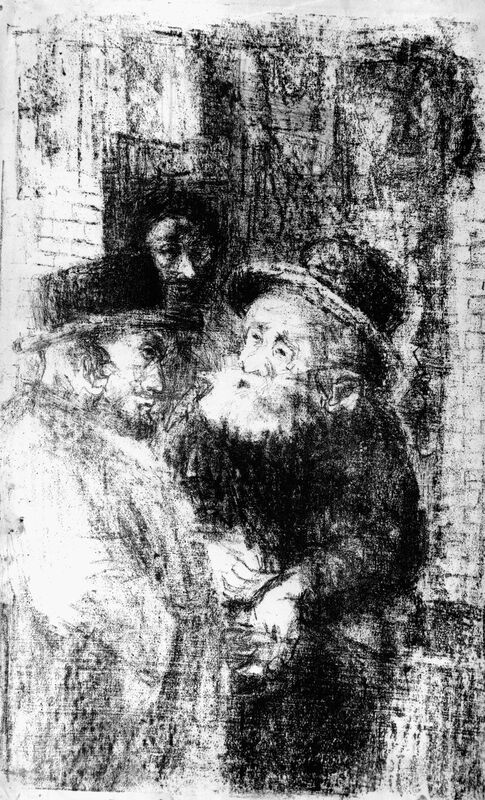 The latter drew attention to her employment as a waitress before noting that 'there is nothing sugary-cakey about Eva Frankfurther's dark, sombre portraits of an old man and a Jew ...'. The same article appeared in the 'Yorkshire Observer', Bradford, under the headline "the Waitress' Eye". exhibition history 'East End Academy: Annual Exhibition', Whitechapel Art Gallery, London, 29 Nov-31 Dec 1953, as (82) 'Jew', £5; (probably) 'Eva Frankfurther 1930-1959: Retrospective Exhibition', Ben Uri Art Gallery, 14 Berners Street, London W1, 14 Feb-9 March 1962, as, (55) 'East End Jew'. literature Anon., 'Jewish Chronicle', 11 December 1953; 'Birmingham Gazette', 28 November 1953; and reprinted, entitled "The Waitresses' Eye", 'Yorkshire Observer', Bradford, 28 November 1953; ed., B. Planskoy, 'Eva Frankfurther 1930-1959: Paintings, lithographs and drawings' (London: Peter Halban, 2001), p. 49.